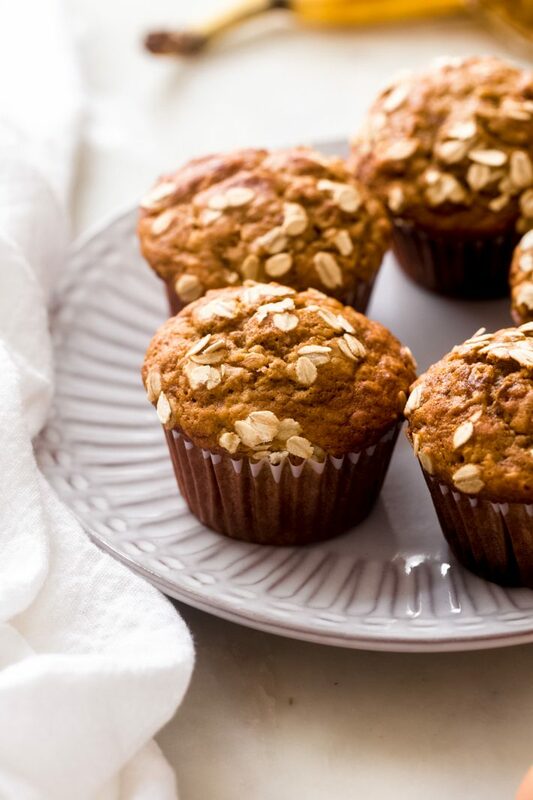 Maple Banana Nut Muffins are the perfect treat for breakfast or for a snack! These muffins are just lightly sweetened and are so tender and moist! These are sure to be a hit with your family! 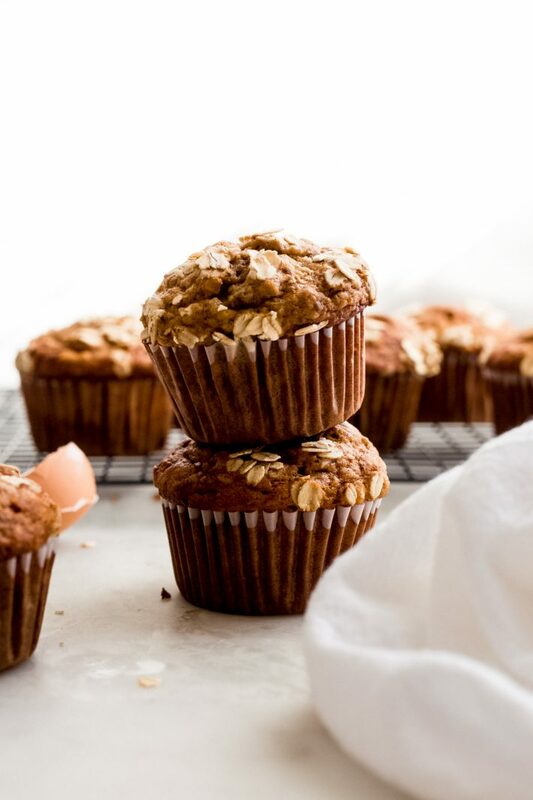 These are my new go-to banana nut muffins that we just can’t get enough of! I’ve made quite a few batches of these muffins in the first week of the new year, and yet, most of the muffins are now gone. They were a big hit with everyone I shared them with and how could they not be? 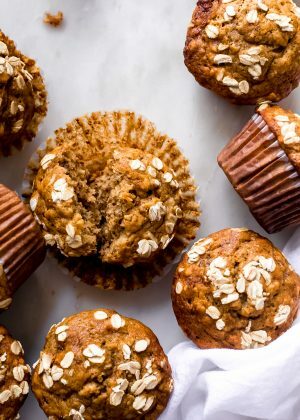 They’re lightly sweetened, loaded with a generous handful of chopped walnuts and those ripe bananas flavor every nook and cranny of these muffins leaving you without any dry crumbs. 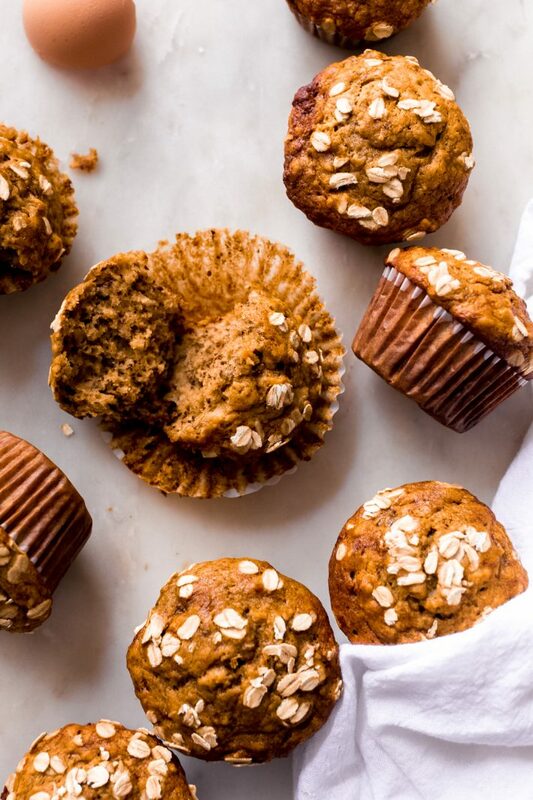 Healthy banana muffins are my go-to snack when I’m heading out for my workout in the mornings, because it’s made with whole grains and is way less sweet than traditional muffins, and it’s better than grabbing a heavily processed, loaded-with-god-knows-what granola bar. Healthy muffins are sorta my jam. It’s the closest thing to cupcakes, and they’re somewhat good for you. That ticks all my boxes! 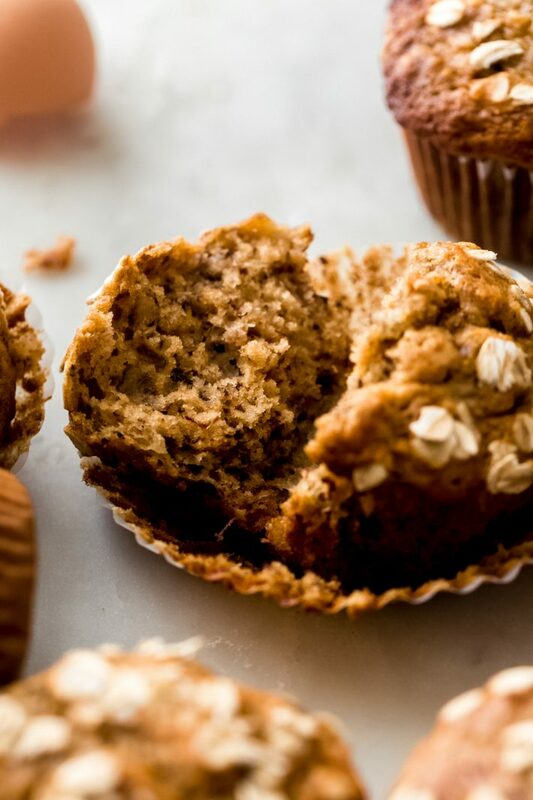 The first healthy muffins I ever made were my carrot cake muffins , which are still such a big hit with you guys! 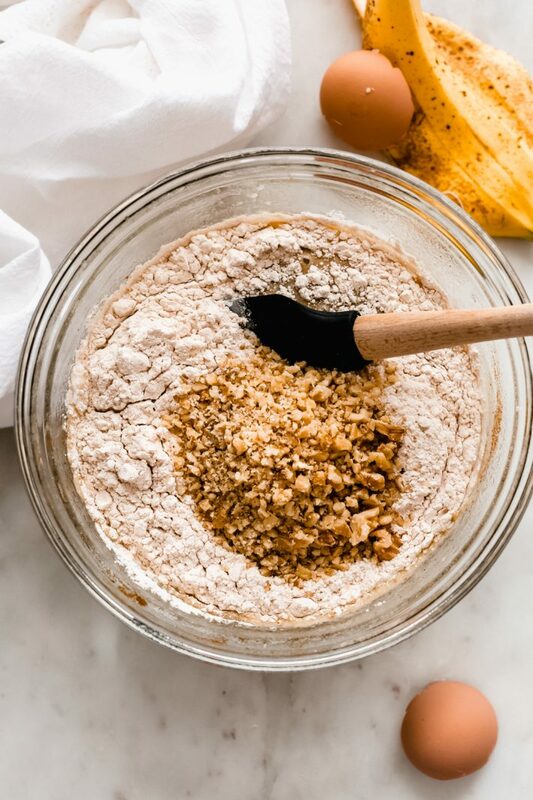 I’ve also shared my chocolate banana muffins  and my chocolate chip banana muffins  in the past so it should come as no surprise that this time, I’m making maple-sweetened banana walnut muffins today. Banana nut muffins have been a favorite of mine since I was a little girl. You know the muffins that they sell at Sams or Costco? The ones that are so big you could split them with a family of four? I used to love those as a kid! The chocolate with chocolate chip were the first to disappear because my brother, dad, and I wouldn’t rest until they were all gone. But I remember my mom steadily working through the banana nut variety, and now, I’m so there too! I’d take a banana nut muffin over a chocolate one any day! Not that we ever buy those anymore. Nope, we’re almost always well stocked with muffins in our freezer! 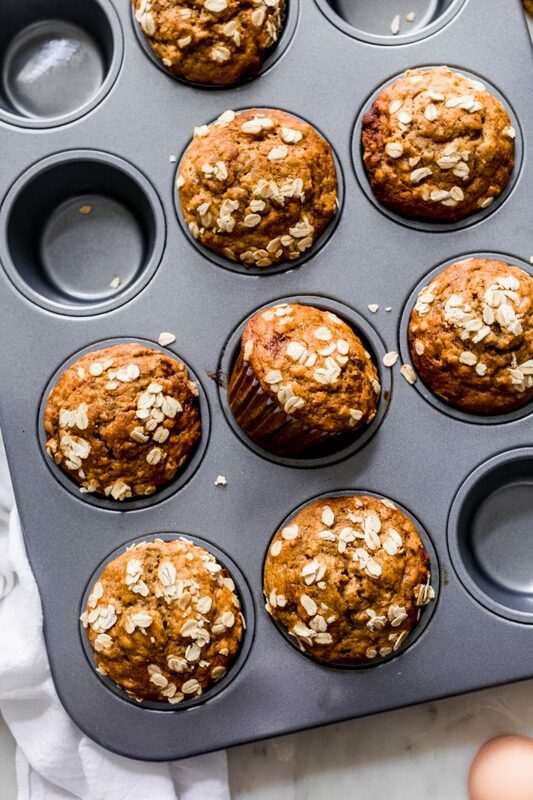 WHAT INGREDIENTS DO YOU NEED TO MAKE BANANA NUT MUFFINS? Natural sweeteners are ones found in nature but that aren’t calorie free. Agave, honey, and brown rice syrup are all examples. The kind of maple syrup I used for this recipe is flavored with vanilla. I found it at Trader Joes for the holidays, and I’ve been itching to use it in recipes. It adds a bigger punch of vanilla to the banana nut muffins, and I hope that it’s not a limited time product because I’m going to use it in all my desserts from now on! There are speckles of vanilla bean in the syrup and even a whole vanilla bean packed in there. I DON’T WANT TO USE REFINED SUGAR, CAN I USE ALL MAPLE SYRUP IN THIS RECIPE? If you’re not a fan of brown sugar, you’ll be happy to know I tested the recipe with all maple syrup as well and it works beautifully here! I prefer the texture of the muffins with 1/2 brown sugar + 1/2 maple syrup, however, all of one sweetener will also work! HOW DO WE GET THE MUFFINS TO LOOK MORE APPEALING? Sprinkling muffins with rolled oats is my favorite way to make them look a little fancier! It all started back when I was making my carrot cake muffins and ever since then I’ve been sprinkling my muffins with rolled oats. Sometimes, I’ll ever throw on a little more of the walnuts I’m using on top of the muffins. Remember, we eat with our eyes first! I DON’T LIKE/HAVE AN ALLERGY TO WALNUTS, WHAT OTHER ADD-INS CAN I USE? 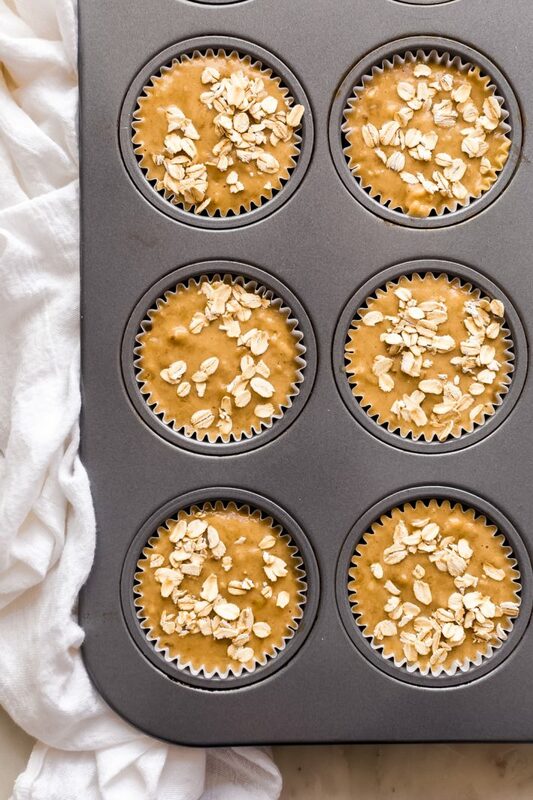 WILL FROZEN BANANAS WORK FOR THESE BANANA NUT MUFFINS? Yes, but you’ll need to thaw them and blot out any excess moisture. I like to do this on a paper towel before using them in the recipe. WHATS THE BEST WAY TO MASH BANANAS? I like to add the bananas to a bowl and mash them using a muddler – yup, the same kind you use to make a mojito with! However, if you plan on mixing up the ingredients in your stand mixer, you can just start with the bananas in there and allow them to mix and mash with the whisk attachment before adding your remaining wet ingredients! WHAT’S THE BEST WAY TO STORE THESE BANANA NUT MUFFINS AND HOW LONG WILL THEY LAST? My experience with banana muffins in the winter is that they’ll easily last at room temperature for up to 3 days and in the refrigerator for up 5-7 days. CAN YOU FREEZE BANANA NUT MUFFINS? The answer is yes; you can freeze these homemade banana walnut muffins! You can bake them off, allow them to come to room temperature, then pop them into a zip top bag and freeze them for up to 2 months. Just let them defrost in the refrigerator overnight, and they’re ready to go in the morning. 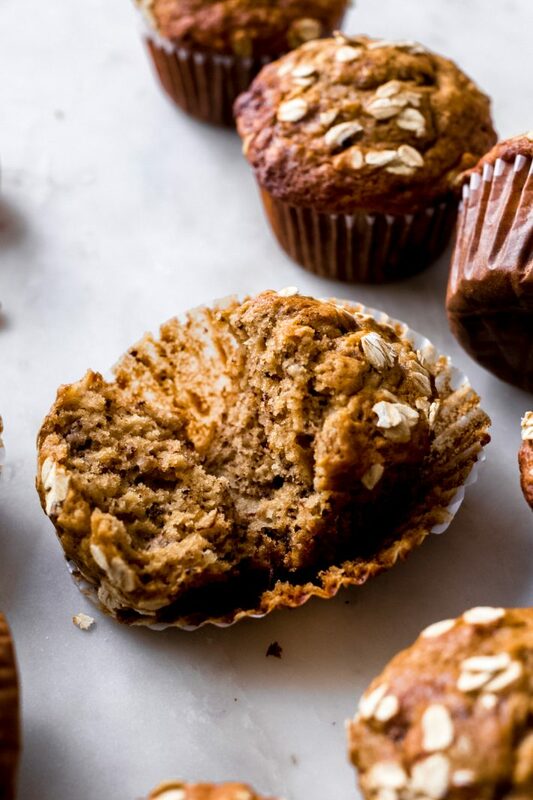 WHY YOU’LL LOVE THESE BANANA NUT MUFFINS? They freeze well so you can enjoy these anytime! PREP: Place a rack in the center of the oven and preheat the oven to 425ºF. Spray a muffin pan with nonstick cooking spray or line it with paper liners. MAKE: In a large bowl, mash the bananas. Then, add the oil, maple syrup, brown sugar, eggs, milk, and vanilla and continue to mix until everything is combined. Add the salt, cinnamon, nutmeg, baking soda, and baking powder. Then add in the flour and fold using a rubber spatula until *just combined. * Add the walnuts (or other add-ins) and fold. BAKE: Divide the batter out into the prepared muffin cups, filling each muffin cup almost all the way full, right below the rim. Sprinkle with rolled oats on top and with additional chopped walnuts, if desired. Bake for 4 minutes then drop the oven temperature to 350ºF and continue to bake the muffins for 18-22 minutes or until a toothpick inserted in the middle comes out with just a few crumbs. Allow the muffin pan to cool on a wire rack for a few minutes before serving. Muffins remain fresh and moist stored at room temperature for up to 3 days or in the refrigerator for 5 days. You can also freeze them for up to 3 months.